Fine tune your game in any type of weather under the covered tee line. We also feature a short range, grass hitting range and putting green, its all here! Toptracer Technology. Now Available at our range! Take your practice to the next level at Northway 8 Golf. As soon as you hit the ball the shot trajectory will be shown in the mounted touchscreen tablet at your bay or in your smartphone. 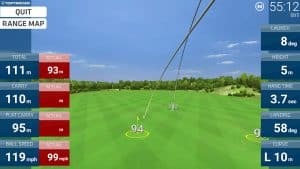 You will also see exactly how far your shot traveled and what your ball speed was. Even better, you can see all existing targets on the driving range in the devise so you will know exactly how close your ball landed to the target at which you aimed. You might recognize Toptracer from TV broadcasts of professional golf events from around the world. 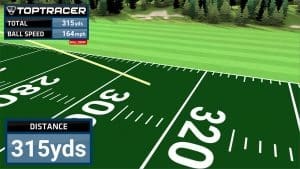 Toptracer Range uses the same proprietary tracking technology, with advanced sensors and software, making it possible to accurately capture all shots hit on a driving range. The customer can view the shot on a mounted touchscreen next to the bay or in their own iOS or Android device. 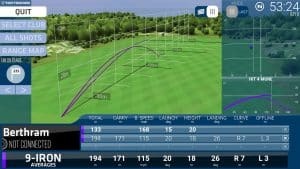 Toptracer Range has joined forces with leading golf and sports graphics company SimWay to revolutionize the concept of playing a round of golf. Long gone are the countless hours at the course and miles of walking. Players now have the opportunity to play 9, 12, 18 or more holes on world renowned courses from their favorite bay at their local driving range. This virtual golf experience will prove to be the most realistic you have ever tried. 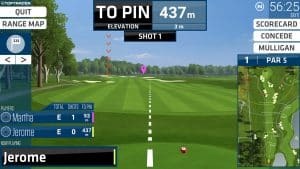 Your shot on the range will appear in a rendered virtual environment of the course you have selected, allowing shot after shot to be tracked and recorded as if you were right on the course. Since you also see the shot trajectory in real life there is never any uncertainty whether your shot was accurately captured. The game runs on a Windows based tablet that can be connected to a TV screen for big picture viewing, and screenshots can be taken to preserve your win. Shots must fly 30 meters in the air in order for them to be registered in the system, and any shot within this distance of the hole will be treated as a gimmie. This virtual golf experience allows up to 4 people to play 18 holes of golf from the driving range, on world renowned courses. Try your skills with stroke play, match play and scramble. Additionally, our short game solution allows players to complete their rounds without guessing. 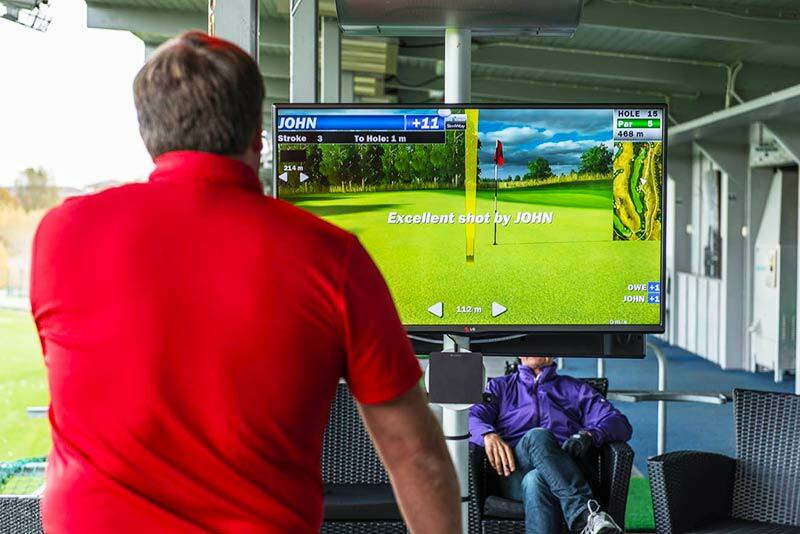 This comprehensive training mode allows guests to hone their skills by offering data such as distance (carry and total), ball speed, launch angle, height, landing angle, hang time and distance to target. This mode encourages Guests to dig deeper into their golf bag and learn the details of each type of club. It also allows them to store those stats over time on the Toptracer Range Network. Who can hit the farthest? 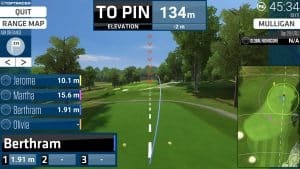 This game lets Guests settle the argument once and for all by turning the range in a proper long drive grid for up to eight players. There’s nothing like a little friendly competition to get some excitement going in the bay. This game allows friends to compete while working on their swing. 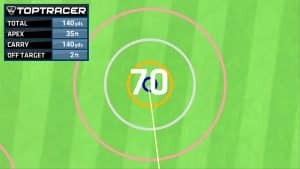 This game lets friends compete for points based on distance from the target and is great for people that like a friendly challenge. This mode gives Guests the opportunity to play some of the world’s greatest golf courses right from your bays. Individuals and groups can play a full 18 holes! Northway 8 Golf’s golf practice facility offers protection from the elements. We have 20 stalls that feature overhead and side protection from the elements. During the winter months, 10 bays are heated to allow our range to be used during all seasons! Our bays feature premium hitting mats to allow a great feel through impact. Our range provides a grass area to hit from. If you prefer a grass surface then head all the way to the end of our range. Our chipping area comes equipped with multiple targets and multiple hitting options. Play the bump and run or hit over a green-side bunker with a pitch or flop shot. You may also hit out of our two green-side bunkers to hone your sand game. Once golf balls are hit onto the chipping area you may not retrieve them. Practice your putting on a true rolling synthetic turf. Practice your short game at our facility to lower your handicap in no time. Custom putting greens can also be installed by Northway 8 Golf. If you like ours, then get one for your own back yard. Leave us a message to request a quote today.